The woman in the cheese shop next store was wearing this same blue outfit, but she is progressive! 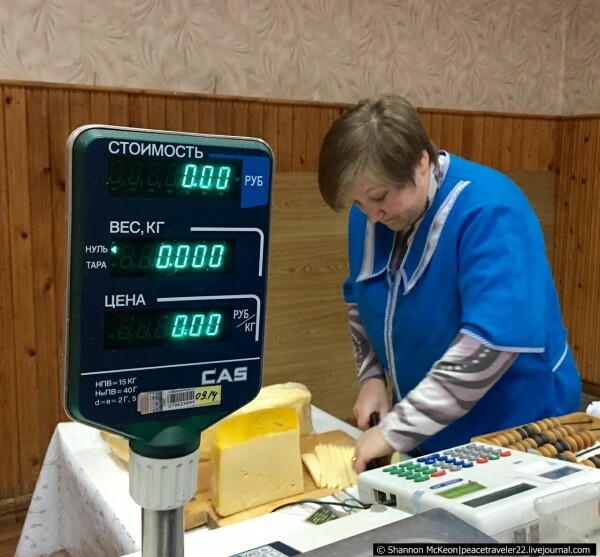 She had a normal adding machine, and even modern day scales to weigh the cheese. I think it's always good to preserve your culture, including some old customs. 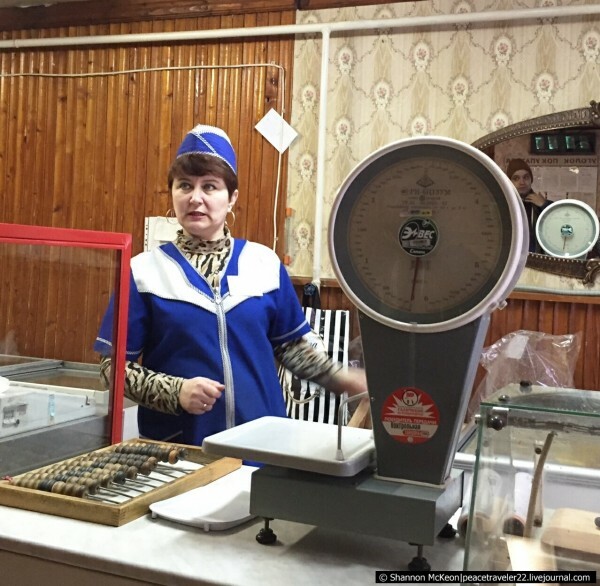 But, yes, I was shocked to enter many small shops in Russian provinces and see no cash register, but this wooden contraption to calculate sales. Not just one or two shops, but a lot. It's marvelous! They use electronic device and old "Scheti" together. This is our nano technologies! The last issue of Skolkovo innovation center. I read online that they also use this thing in Asia and Africa. I've been to a few Asian countries, but have never seen it anywhere until this trip. «Wooden contraption»™ can operate without electricity and without batteries or rechargeable batteries. Even if a power failure in the village shop will continue to work. Wow. 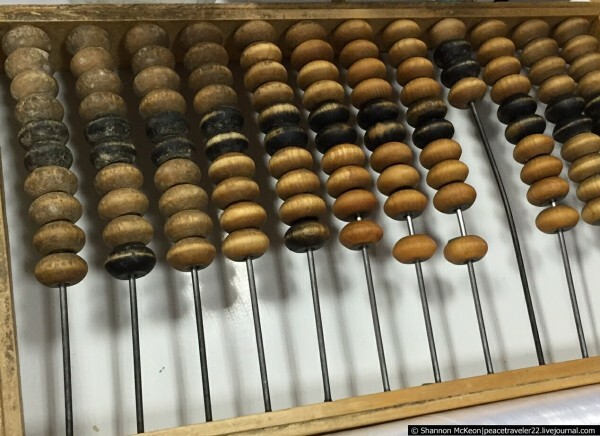 I haven't seen these abacus things for ages. I never saw them until this trip, probably because we were in much smaller cities this time. belenki is Jewish. Stop calling him "Russian". He has nothing to do. Yes, a Russian Jew. And, what does it have to do with anything? Что загадочного в том, что в глубинках прогресс отстает? Разве это особенность России? Меня счеты смущают меньше, чем отсутствие шапочки у продавца сыра. And no gloves! In U.S. stores, workers are required to wear them when cutting meats and cheeses. I haven't seen abacus since my childhood. I really feel nostalgic remembering the old times. I visited Russian province lask week and expected to see the abacus in the small shops, but I didn't see any. And here they are. You've made my day :) Thanks for the photos!! - Оглядись и постарайся запомнить три вещи коричневого цвета и закрой глаза. - Теперь назови вещи... синего цвета! На что мудрый человек ответил ему: «Открой глаза, осмотрись ведь в комнате очень много вещей синего цвета.» И это было чистой правдой. Тогда мудрец продолжил: "Этим примером, я хотел тебе показать, что ты должен видеть всё, а не только то, что желаешь." Parts of this trip were extremely "hard-core," esp. spending the day and night in a real Russian village. But it was the best experience of the journey. in some aspects wooden calculator is more useful than a "modern" digital one. especially under conditions of russian provincial town. How is it more useful? I think a basic calculator is more useful, regardless of whether it's being used in a big city or province. BTW on these photos they both have cash registers with memory (they have to, by the law). On the first photo you can see it partly on the very left. The other question is why they use an abacus instead of an electric calculator. помню, мы в школе счёты на математике проходили, один урок занимало. сейчас наверняка уже нет в программе. You had a lesson about using the abacus?